These were a down couple of years for Schulz’s Peanuts strip. Schulz was no stranger to revisiting things; most of Peanuts most iconic aspects (Linus’ security blanket, Charlie Brown and the football, etc.) grew to be well-known through repetition. I accept that, and normally I’m okay with it, as long as he doesn’t appear to be copying and pasting as he does in some of the strips in this volume. Once every couple pages, for example, it seems, Snoopy gets into a tussle with Linus for said security blanket. There are only so many possible variations on that Schulz could use, and he runs through all of them at warp speed. Similarly, Schulz really harps on that joke involving Lucy being a “champion fussbudget.” I didn’t mind it early on, when it first appeared, but again, like with the previous example, there’s little room for variation, and eventually you’ve just heard and seen it all. Call this blasphemy if you wish, but I’d pay good money for a separate Peanuts collection minus most of the running gags. They’re the reason why the strips I saw in the comics section of the newspaper growing up never impressed me much; I knew they were running a different comic each time, yet they ran together still since it often seemed like they weren’t, what with some strips feeling, as I said, copy-pasted from previous ones. What ignited my newfound love for Schulz and his Peanuts strip are the moments in which his characters stop feeling sort of like a collection of callbacks and start feeling like real people. Notice I didn’t say kids, because Charlie Brown and his friends, if you can call them that, have always been deeper, richer personalities than any child I’ve ever known. 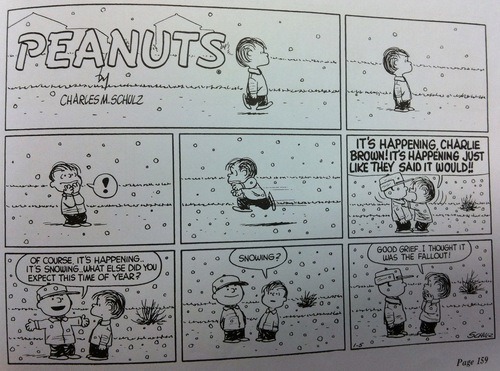 Through them, Schulz displays the struggles we all experience, regardless of age. I truly believe anyone could read this strips and find a little of themselves in one of the characters. 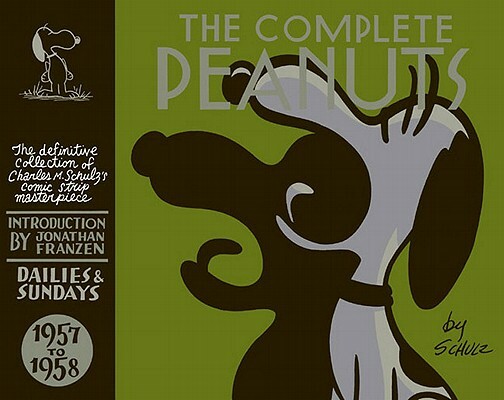 Volume four retains those moments, but for the first time they’re outnumbered by Peanuts‘ recurring jokes and gags. Some would say this is reason numero uno why this was the start of Peanuts as we know it. They could point to the strips that were used, verbatim, in the TV specials and movies (see above) as evidence to this fact. And I would respond by saying, although it was cool to see strips like that where I could picture the later animated version in my head, and while I like Peanuts to have consistency in the sense that its characters remain true to what’s already been established (e.g. 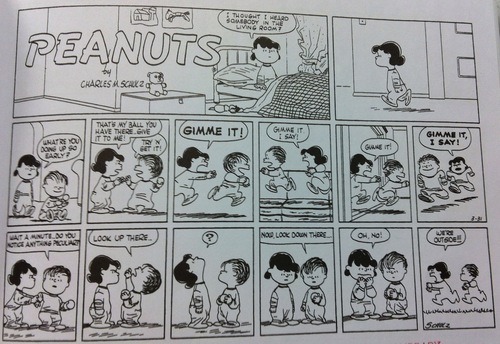 Lucy will always pull the football away, Schroeder will always be a Beethoven fanatic, etc. ), I don’t want the characters, and by extension the strip, to become defined by those base characteristics. In other words, having Linus and Snoopy play out that same battle for that security blanket of Linus’s time and time again gets tiresome fast, whereas Lucy being cruel towards Charlie Brown isn’t as narrow a gag, allowing for more variety and, thus, having a longer shelf life. Volume four, unfortunately, is comprised mainly of the former. 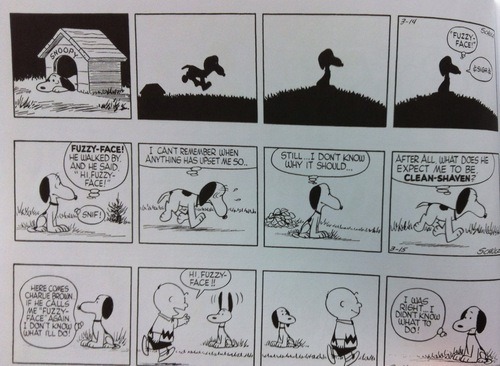 Snoopy, for instance, continues to aspire towards being, and pretend to be, other animals. It was cute at first, but not anymore. Give me the pensive, meditative Peanuts seen here, the one that blindsides you with sincerity and emotion, the one that isn’t afraid to break from the usual self-contained strips to give a moment (or a joke) enough time to breathe, to have maximum impact. Also, give me the Peanuts that’s not afraid to catch you similarly off guard with an unexpected joke like the ones below. That’s two meta jokes, one that’s born of our fear of the nuclear bomb, another relating to politics, and another that’s grammar-based. It’s that flexibility that I admire Schulz and Peanuts for more than anything; some consistency is nice, but too much and the strip starts to read like Schulz well is running dry, which it clearly wasn’t, given how long the Peanuts strip ended up going, and the fact that for every couple misses, there was a spectacular hit to make up for it. I hope volume five shifts the balance back in favor of the unexpected, as opposed to the old and the rehashed. This entry was posted in 3 stars – a good book and tagged Charles M. Schulz, The Complete Peanuts, Travis_J_Smith. Bookmark the permalink.